Susan Frackelton (1848-1932) was a pioneer in the American Arts and Crafts Movement, due in part to her unique china painting and pottery style. A student of master landscape painter Henry Vianden, Frackelton utilized his teachings to incorporate naturalistic themes, both in her china painting and art pottery. Through her entreprenurial spirit she was able to run a sucessful china painting business in downtown Milwaukee, as well as teach classes to students on the second floor. The release of her china painting manual, Tried By Fire, won her acclaim by her peers within the decorative arts movement and among Milwaukee women. Frackelton took china painting one step further by applying for, and receiving a patent for a kiln that was designed for use in people’s homes. 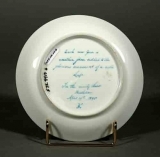 By the 1890’s, she gravitated towards pottery throwing and painting, receiving numerous exposition medals and awards for her unique style. 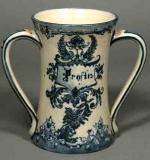 The Frackelton “Blue and Grey” is characterized by its grey glaze and blue painted decorative patterns. This style helped move functional pottery into the realm of “art pottery”, a medium that sees pottery as an art form, not as a functional tool. Other examples of her collections can also be found at the Wisconsin State Historical Society, Milwaukee Public Museum, and Sinsinawa Mound.